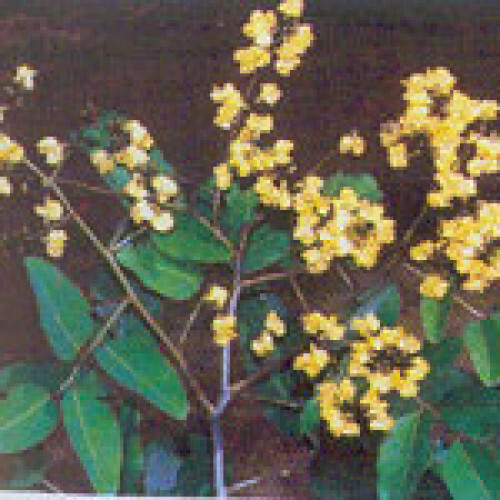 Pterocarpus marsupium, or the Indian Kino Tree is a medium to large, delicious tree that can grow up to 30 metres tall. It is native to India , Nepal , and Sri Lanka , where it occurs in parts of the Western Ghats in the Karnataka - Kerela region. It is also known by the names Malabar Kino, Benga, Bijiayasal (in western Nepal), Piasal , Venkai, and many others. Parts of the Indian Kino (heart wood, leaves, flowers) have long been used for their medicinal properties in Ayurveda. The heart wood is used as an astringent and in the treatment of inflammation and diabetes.